When I first heard about just cause 2, not having played the orignal (a mistake that I intend to rectify as soon as possible), I thought that this would be a game about the fight of a man against the system that has taken away everything from him.Talk about a misleading name.Nothing could be further from the truth.It is still the fight of a man against a system not because it has wronged him but just ‘cause he can .Although there is some story behind why Rico (or scorpio) is doing the things that he is doing it is mostly just a filler and an excuse for over the top action in the game.That is not a bad thing as it works in the games favor by keeping the focus on causing chaos on a very large scale rather than tie down the player in a long narrative. Just Cause 2 ,like it’s predecessor, is an open world game.It differentiates itself from other open world games by providing a really nice way to navigate around in the form of a grappling hook and a parachute.It is like spidermans’ web slings just a lot more fun to use.The game encourages you to use the hook in inventive ways.Hooking on enemies and small objects will allow Rico to pull it towards himself, this can be pretty useful when dealing with pesky snipers.Or by attaching the ends of the hook to different objects you can connect them.This method can be used to take down statues of the president in the city.One of my favorite uses of hook is in free falling.Rather than opening a parachute I prefer to free fall all the way till I am in the range to hook to an object.It then saves my life by preventing a direct fall. There is however one really big problem with the game.The vehicles.They are horrible to control.I could never get them to do what I really wanted.Their physics is pretty bad too.It is one thing for the dead bodies to have a rag doll effect but when trucks start turning and bouncing on impact…well lets just say it is hilarious.That is not to say all vehicles control badly.Only those on land do.The handling of vehicles on air and water is great.The helicopters in particular are a joy to fly. The island of panau is absolutely stunning.The visuals in this game are breathtaking.The geography of the island is well thought out and the map design is very good.Often I have found myself just sitting in front of my laptop and enjoying the view.In one particular mission , where I had to rescue a prisoner from a casino in the middle of the desert, I was treated to such a wonderful view that I revisit the place every once awhile.There is no substitute for riding a motorbike across the sand dunes on a hot sunny day.No matter how many times I replay it,it always makes me feel like an adventurer. The residents of panau are simple minded and colorful folks governed by scheming politicians whose only agenda is to dupe its’ own people.For instance, Rico is hell bent on causing chaos in the city .He destroys numerous key points and the government tries to cover it up by broadcasting on the radio that the “rumors are false”.On destroying the nuclear power station a broadcast can be heard that says “There was no terrorist attack the sounds that were heard was a result of equipment backfiring”.The people are very easy going and it seems out of place to cause explosions in an idle city like this which makes it all the more appealing. 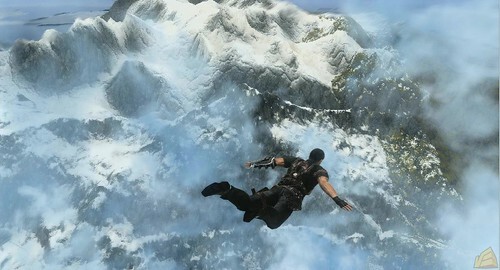 Just Cause 2 is not a game that is meant to be played in a single session.It is a game that is best played in small doses.I must admit that the first time I played it, it did not make that much of an impression on me.But as I have spent more and more time with it, it has really grown on me.